The Heavenly Banquet: Confessions: You'll Need a Copy! Confessions: You'll Need a Copy! 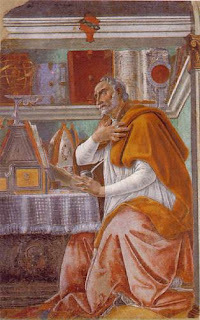 As we prepare to gather on September 12, 2011 to begin reading the Confessions of Augustine, many of you have reported dusting off a copy from your shelf, locating a copy in your church library or happening upon a copy in a used bookstore. Some of you have asked for advice on navigating the many editions and translations of Confessions available. The quick answer is that any version will do, and I'll explain that in more detail below. If, however, you want to purchase a new copy of Confessions. then my recommendation for the best translation currently available is Maria Boulding's work for New City Press, 1997 . In my opinion, this version offers the very best marriage of accuracy and beauty in rendering Augustine's work into English. If you want an electronic copy of Confessions, then you might also consider one of the translations listed at Christian Classics Ethereal Library. Many of these can be downloaded as a PDF at no charge. You might wonder how we'll maintain a discussion if we all use different versions of Confessions. That's a fine question! Let's imagine that we want to cite one of the most well-known passages in Confessions. On page 262 of the Boulding translation , a reader will find the opening of Augustine's prayer, "Late have I loved you, Beauty so ancient and so new, late have I loved you!" Those using the Oxford University Press printing of Henry Chadwick's translation would read, "Late have I loved you, beauty so old and so new: late have I loved you," on page 201. Those using the Penguin edition of R. S. Pine-Coffin's translation will read, "I have learnt to love you late, Beauty at once so ancient and so new! I have learnt to love you late!" on page 231. How might we direct one another to this passage if we aren't on the same page? The good news is that Confessions is divided into sections which can be easily referenced. The particular passage quoted above is found in Book X, chapter 27. The form (X.27) is often used as a citation for this unit of text. Many editions include paragraph numbers as well. This helps readers navigate more quickly to even smaller portions of the text. If we add the paragraph number to our citation, then we have (X.27.38) as a more detailed way to reference this passage. As you see, our discussions won't be adversely affected if we use a variety of translations. In fact, if we notice instances in which our translations differ significantly from one another, then we'll find ourselves with a good discussion point and an area of investigation. Please feel free to use whatever is most convenient or whatever suits your needs best! We'll look forward to the insights you share from any translation you choose. I'm in...found on page 152 of Pilkington's translation found in the Nicene and Post Nicene Fathers. Looking forward to it! Great! I'm so glad you are joining us, Vern! Mary Charlotte Elia. Simple theme. Powered by Blogger.